Babalon Unveiled! We are pleased to announce the release of this long-awaited book. This collection of 36 monographs serves as a well-rounded introduction to the Law of Thelema. It is also a luminous esoteric study to widen the horizons of those familiar with the rationalist explanations that have prevailed until now. ‘Lapis Philosophorum’ redefines the magical philosophy of Thelema, liberating it from the accretions of the past as well as those of the modern age. The philosophy of the West only understands consciousness in terms of a supreme demiurge, pristinely ‘one’ and therefore alone, or as the isolating confinement of the self as its own God in its own reality. Both points of view posit an atomistic intelligence that cannot be. They excuse the impossibility of the premise by insisting that true reality can never be known. They allure the faithful with promises of a hereafter reward for those obedient to dogma or otherwise draw the proud ones with the glamour of unlimited power in self-created worlds. Both projections are based on the paranoia of self-isolation. While the text of the (Egyptian) Book of the Law transmission carries great value for some, for most it will remain a disturbing enigma. The Law of Thelema will not be grasped by intellect alone, or by merely studying the text of the Cairo transmission, yet the doctrine can be explained in clear and simple terms. For those so prepared, and that are willing to translate thought into action, full activation of the 93 Current is possible. 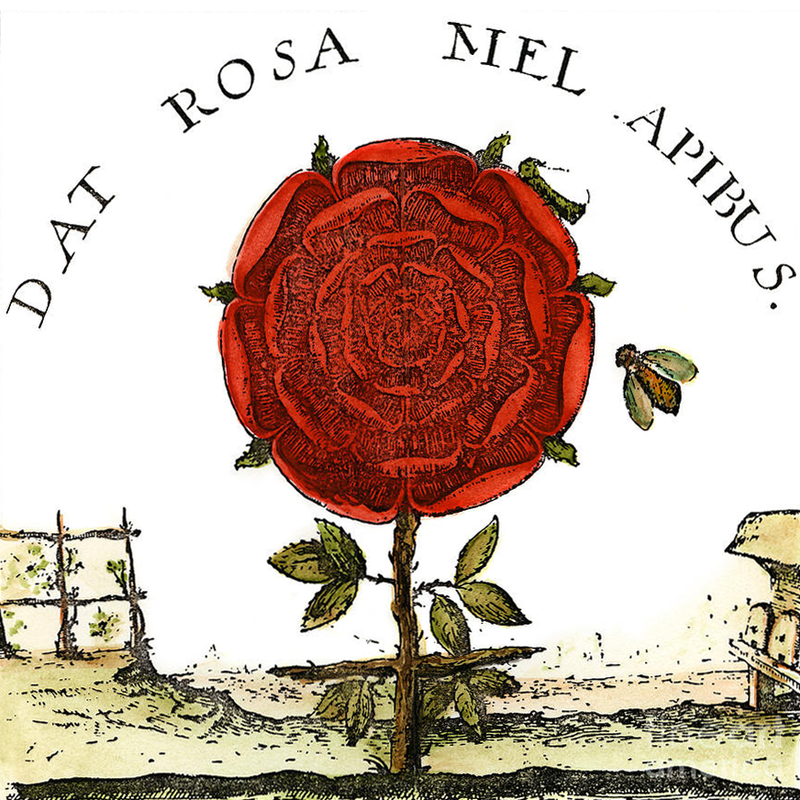 This was expressed in the language of the alchemists as the ‘philosophic stone’. The mode of thought is not the stone itself, for the stone is a symbol. All thought is symbolic. Consciousness is. The book is dedicated to the memory of Rose Edith Kelly, Ouarda the Seer. 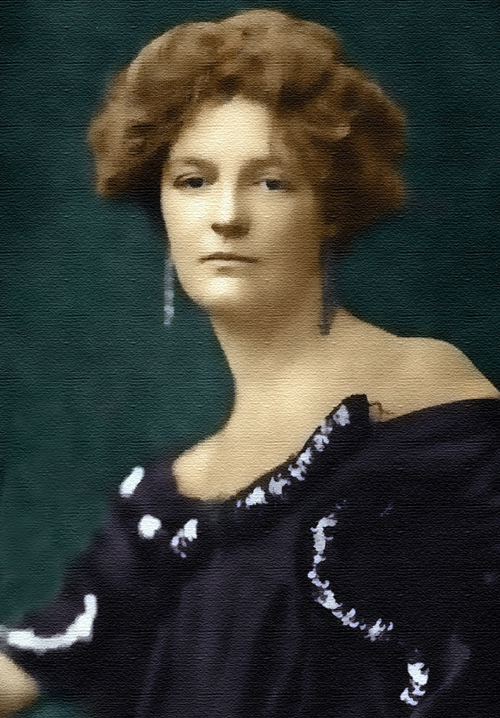 Rose was the medium and intelligence for the transmission activated through the Stele of Revealing in the Cairo museum in 1904. ‘Babalon Unveiled!’ forms the centrepiece of this collection and is one of seven related studies on the mystery of the Scarlet Woman. Each shows an aspect of her oracular voice as it has been heard and recorded down the ages. The use of the word meretrix over time reveals how the oracular word was sold into prostitution when the patriarchal death cults of religion and science superseded the old ways. ‘Angels of Sacred Dance, Love and Whoredom’ examines how the divine feminine of pre-religious antiquity was demonised, resulting in a host of ‘fallen angels’ whose identity is yet preserved, albeit under a heavy veil in traditional Qabalistic texts. Format: 6 x 9 hardbound dustjacket; blue linen boards; gold foil stamp lettering on spine; black on cream pages, white end-papers. Read abridgement of the monograph, Babalon Unveiled! here at Tantrika Books. Read abridgement of the Esoteric Doctrine of Thelema here at Ordo Astri. 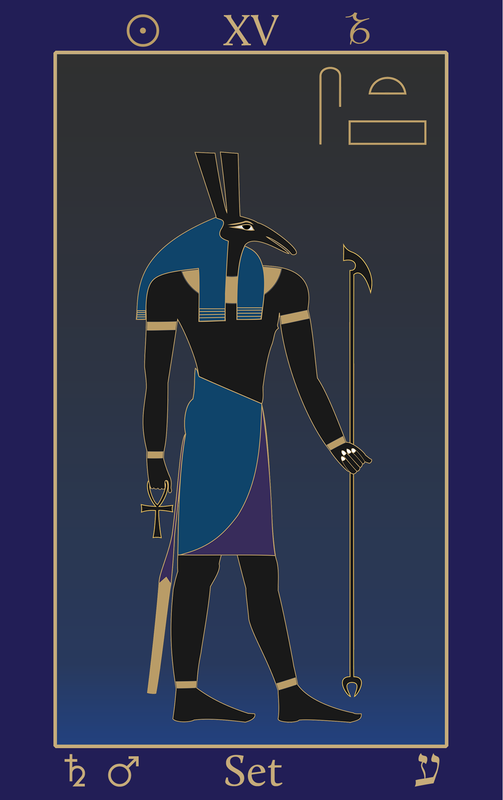 The Capricorn Solstice is depicted here by our Egyptian Tarot of Thelema image of the god Set. The esoteric title of the O∴ A∴ deck for Atu XV is Lord of the Gates of Matter: Child of the Forces of Time. The Thelemic year begins for us, not on the 20th March each year, but on the winter solstice, when the Sun crosses the zero degrees mark of Capricorn. The 26th path of Capricorn is the Renewing Intelligence, and the time of year marks the first light of the Khabs in the Khu, sounded in the depth. Cancer and Capricorn mark the height and depth of the Sun. The equinoxes mark the cardinal crossing. The four cross-quarters mark the Kerubic signs, Aquarius, Taurus, Leo and Scorpio. Commencing from the winter cup of Capricorn and Aquarius, we can follow the course of the Lightning Flash on the Tree of Life through the year. Capricorn and Aquarius, ruled by Saturn, send the current from the supernal Eden to the sphere of Jupiter, ruler of Pisces. The next station is Aries, ruled by Mars, in which is the Sun’s exaltation. Next comes Taurus, ruled by Venus, the lovely star. We then pass across to Mercury, ruler of Gemini. Arriving at the solstice of the summer cup, the Moon and Sun are conjoined and the Holy Hexagram declared, with the Earth as witness. The current then streaks back up the Tree, in reverse order until the Capricorn solstice is again reached. The number 3 is that of Saturn, ruler of Capricorn, Binah and therefore Set-Typhon. It requires a triangular prism to split white light into seven colours, for only the triangle can reduce a phenomenon to its components. Therefore, the rainbow spectrum is the veil of Set, sevenfold. Seven is the number of Venus, who doubles as both morning and evening star, and Saturn is the ‘power behind Venus’. Set is the most difficult of gods to ‘pin down’; his very nature forbids it. He is on the other side of wherever we happen to be, in terms of consciousness. The function of Set is dual. Firstly, Set veils the invisible in an infinite variety of forms. Secondly, he destroys the illusion of the appearance of things. Set is identified with Sirius, the star of Egypt, and is the manifestor of the seven stars of Ursa Major. Sirius is the birthplace and home of the gods. It is the star of the ‘one in eight’ as Set-Hadit, manifestor of the seven and revealer of Nuit. Sirius is the ‘sun behind the sun’ of our solar system, the transcendent regulator of all terrestrial aeons. Both the Egyptian and Greek names for the star, Sopdet and Sothis, are not well disposed for application in ritual sonics. The Aramaic word, Avrek, or Aurek, suits our purpose well. AVRK has the Qabalistic number 227, and means, ‘Sirius’, ‘shining, flowing’. This noun has the same root as the Nile of Egypt, IAVR, 217, ‘river; light, flowing in a stream’. This identifies the word vibration IAO with the outflow from Ain Soph. Thus IAO typifies Da’ath as the portal for sonic utterance from the mouth of Ain (zero, sifre). IAVR is the light-radiation consciousness current itself. The river Nile and Sirius, the star of Isis, are so closely linked as to mean the same thing. If we add the holy ‘IA’ to AShRH, the divine name in Kether of Atziluth, we have IA-AShRH, 517, the light flowing consciousness current of supreme Nuit. AVRK, 227, is a metathesis of ARVK, 227, ‘lofty’, ‘noble’, ‘tall’ or ‘giant’, the name given in the book of Genesis for the Nephalim or antediluvian elder race that preceded that of humanity. The number 227 is also that of ZKR, given as ‘phallus’ ‘remember’, ‘to be named or mentioned’. 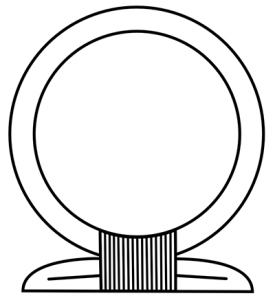 The phallus here means ‘image’, or the projection of the light of AUR. 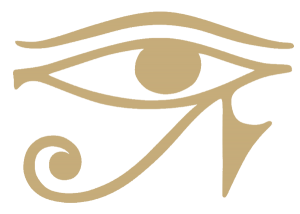 The word is identical to the name of the Egyptian hawk-headed Lord of Death and Resurrection, Sokar. At Sokaris, or Saqqara to use its modern name, is a vast Necropolis. The region, west of the modern city of Cairo, holds many secrets. It is here that the labyrinth beneath the so-called Serapeum was constructed aeons ago, and by precise alignments, highly polished vessels made from one piece of solid granite hermetically sealed and placed. The remembering is the memory of ‘the elders’, ZQNIKM, also equal to 227, as is IAIRI, ‘they shall give light’. 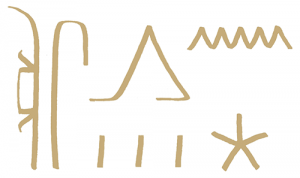 AVRK, the star of Egypt, may also be spelled ABRQ, 303. ABRQRBA may therefore be considered as the pure form of the corruption given in the Key of Solomon and other grimoires as ‘Abracadabra’. Aleister Crowley rendered it as the elevenfold ABRAHADABRA, equal to 418. He explained this in monotheist terms, as ‘Father-Sun-Hadit’. The sevenfold spell of ABRQRBA, on the other hand, is a palindrome equal to 506. The number 506 is a number of Nuit as conveyed by the riddle of Liber AL, I: 46–47, and of Asherah (AShRH), ‘the woman’ and original bearer of the Tree of Eternity or Life. Her sacred grove is the supernal Garden of Eden that is the image of the terrestrial sphere as created in the minds of the elder race. By Greek values, ΑΒΡΧ is equal to 703, the word of a Magus that opens the door of Mystery. The palindrome then equals 806, ‘Divine Sophia (Wisdom)’ and ThVTH or Tahuti, the Lord of Utterance. 1. The drawing of Set is based on that of Jeff Dahl. This is a prototype of the Order deck; the images will be redrawn for the final version. 2. The alignment of the O∴ A∴ with the Typhonian Thelemic dating system commences from the Capricorn Solstice, 2018. The New Year begins here, Anno V–5, year of the Hierophant by ROTA correspondence. 3. This paragraph is fully explained in the book, Babalon Unveiled! Thelemic Monographs. 4. The section on ABRQRBA is also explained more fully in Babalon Unveiled [ibid]. 5. A great deal more can be gleaned by studying the values given for the number 703 and 806 in The Flaming Sword Sepher Sephiroth [Ordo Astri].